Scuba divers will be amazed at the diversity of marine life and spectacular coral formations of the Bait Reef. Certified divers experience the thrill of a night dive and introductory divers be prepared to be taken exploring with experienced Dive Instructors. Diving the Outer Reef is something you will tell your friends about. Blue Pearl Bay in Hayman Island is another of the most popular dive Whitsundays sites, as it is protected from the South East Winds, meaning visibility is good almost all year round. The bottom of Blue Pearl Bay is covered with many unique corals and hundreds of colorful fish species, including parrot fish, cod, giant mauri wrasse and many more. At a depth of approximately 20 meters, Mantaray Bay, the biggest bay in Hook Island is another of the great scuba dive Whitsundays favorites. Here you can see a wide variety of aquatic life, with manta rays being especially populous. Oublier Reef has a depth that ranges from 0 to 75 meters, and is a truly special site, featuring enormous walls and both deep and shallow areas where you can see magnificent corals, fish and more. Another scuba dive Whitsundays site we often visit is that at Mackerel bay, situated close to Hook Island. The depth here is approximately 15 meters, and it’s a most beautiful spot, featuring spectacular coral formations, just below the surface of the waves. Visibility here is fantastic and the aquatic life is incredibly varied. What’s more, the site is suitable for both scuba dives and snorkelling. 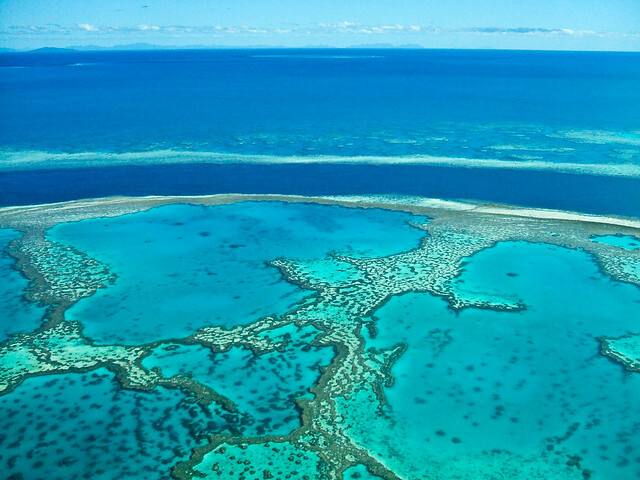 The Great Barrier Reef is blessed with the breathtaking beauty of the world's largest coral reef. The reef contains an abundance of marine life and comprises of over 3000 individual reef systems and coral cays. A closer encounter with the Great Barrier Reef's impressive coral gardens reveals many astounding underwater attractions including the world's largest collection of corals (in fact, more than 400 different kinds of coral, some are: coral sponges / mollusks / branching / plate / table / vase / bushy and solitary. The entire Great Barrier Reef and the Whitsundays is an important breeding and feeding area for turtles which nest locally. It is the home of the biggest Green Turtle population in the world. Green turtles live in seaweed-rich coral reefs and feed mostly on seaweeds and mangrove fruits. Great Barrier Reef has 13 major rookeries and turtle nesting occurs between late November and January. It takes a female green turtle 30-40 years to reach maturity. Although the green turtle population is recovering, they are still threatened by hunting, boat strikes and drowning in crab pots. Their biggest threat is the discarded plastic debris that is mistakenly swallowed causing blockages of the stomach and intestines. Sea turtles, especially green turtles, are known to bask at the water's surface and are sometimes slow to react to approaching vessels. The Great Barrier Reef is a breeding area for humpback whales, migrating from the Antarctic each year. Summer is spent in the cold waters of Antarctica, where they feed on enormous quantities of the prawn-like krill. In autumn, as the temperature falls and ice begins to form on the sea surface, the whales begin their northward migration to tropical waters to give birth and to mate before returning to Antarctic waters at the end of spring. Whales are most likely to be seen in the Whitsundays and Great Barrier Reef between June and October. Famous for being the largest living structure in the world and for being visible from space, the Great Barrier Reef is a listed World Heritage Site and one of the Seven Wonders of the World. The Whitsundays are located just off the coast of Queensland, and this makes it the perfect base from which to chart this natural wonder. Stretching for a massive 2000+ kilometers in length, the reef affords protection from the Pacific Ocean swells to the coast of the Whitsunday islands, which means the waters here are some of the safest in the world for sailing and diving. If you have a passion for diving, then the Great Barrier Reef Whitsundays is a paradise on Earth. With thousands of colorful species of fish and coral, along with dolphins, whales, turtles and more, the diversity of this underwater play ground is truly immense. If you prefer snorkeling to scuba diving, you can visit the warm and shallow Great Barrier Reef Whitsundays waters just off the island, where you can spot dazzlingly colorful fish, amazing coral formations and more. Meanwhile, if diving isn't your thing, just stay dry and enjoy the luxuries on offer aboard the comfortable catamaran fleets.